Yes, I'm a pain about this. The registration for the Dragon Awards is ALMOST CLOSED. Registration closes THIS SUNDAY. SUNDAY SUNDAY. So... click here. Get on it. The Award Winner Announcement will be on Sunday, September 4th, at 2:30 PM. However, there's no actually mention of a physical award. Hmm. Dang it, I really did like the idea of this award. Yes, I know, it's probably not what the award would look like, assuming there's an actual, physical statue. But, then again, for all I know, they 3D print the awards on site. Yes, I did basically make an entire post dedicated to that photo. Because I'm strangely fond of it. 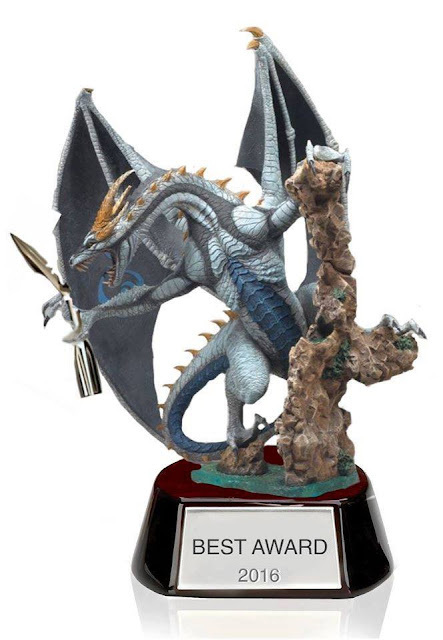 Anyway, I will probably wind up bringing home two Dragon Awards. Why? Because I volunteered to accept the award on behalf of John C. Wright, and for Brian Niemeier. I'm going to feel ridiculous if I've volunteered to pick up an award that's going to be mailed out later. Anyway, if you haven't registered yet, do it not. This minute. Go ahead. CLICK HERE. And, once you're there, vote for Honor at Stake. Heh. Buy the book here.